MiSiS mistakes were made, and LA Unified can expect to fork over millions more dollars to fix the software system’s myriad problems and get the program functioning properly. In all, it was another demoralizing revelation about the MiSiS rollout debacle last night, and school board members’ frustrations quickly boiled over, leading to a verbal beat down of Chief Information Officer Ron Chandler, who served as the face of a new request for $3.6 million to buy 3,343 desktop computers for the nearly 800 schools with the most difficulty accessing the computer student data software because their devices are incompatible with the system. “This should have been readily apparent all along and it should have been one of the considerations when rolling MiSiS out,” said Tamar Galatzan, whose every statement on the subject ended with a verbal exclamation mark. An obvious question to ask before developing the system, she said, would have been, “What kind of devices are members going to use to enter this data? Beside the fact that the system doesn’t work, if you don’t even have a computer that’s new enough to be able to run it, it’s just ludicrous!,” she said. When Chandler tried to defend his department’s actions, noting that the district failed to invest scarce dollars in acquiring new machines as a result of the recession, Steve Zimmer went on the attack. “That was not a choice the board got to make,” he said pointing a finger at Chandler. As a temporary fix, many administrators and teachers have been using iPads that were bought as part of the one-to-one program to access MiSiS and input data into the system — a solution that Galatzan and Bennett Kayser suggested is an inappropriate use of the devices. “[These] devices should never have been used for MISIS inputting, and to think they were going to bail anybody out, that bothers me on so many levels,” Galatzan railed. In the end, the board approved the expenditure, 6-0 — George McKenna was absent for the vote — which will draw from bond funds for the purchase. The School Construction Bond Citizens’ Oversight Committee in a recent meeting recommended against the buy, arguing it could not approve purchasing additional devices without an accurate inventory of the devices schools currently have. But this is just the first of more spending requests to come, Matt Hill, the district’s Chief Strategy Officer told the board. Hill says additional requests for MiSiS devices will be presented at next month’s board meeting. “That was just for central office. We will come to you with a precise number for teachers to use MiSiS…programmers to fix the bugs and testers to make sure it’s working. Right now users are updating us on bugs and that’s not ok,” he said. The district also needs to spend more on training, which a recent report by a court-appointed independent monitor determined was ineffective. The board plans to take up a discussion on the monitor’s report, released earlier this week, at the Oct. 21 board meeting. There are some indicators that the Information Technology Division, which developed MiSiS, is finally getting out of triage mode according to Hill. Calls to ITD’s support hotline are down and so are the length of the calls. And most problems linking special education students to the right services have been resolved, he said. The next big deadline for the district is reporting the number of Title I students to the state to qualify for extra federal funding. The district has to submit those figures by Oct. 23. Deadlines to apply for scholarships and early admission to college is fast approaching for students, a concern raised by Zimmer and Galatzan caused by a glitch in MiSiS which doesn’t factor in grades or credits for classes taken at community college, adult school, or classes that are repeated. 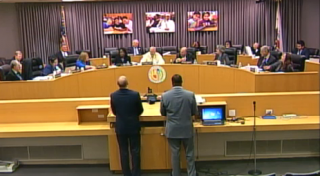 Galatzan then suggested that LA Unified contact the admissions offices of all the UC and Cal State campuses to “make sure they understand our MiSiS problems.” Students applying to schools outside the California systems could attach a letter from the district acknowledge the error. “Let’s write a letter to ‘Dear Admissions Officer’,” she told Hill, then suggested adding his number to the top of the letter.